Wow, it seems like I was dead in the Internet world! I was offline for a few months. My IT computer guru said my blog site crashed due to corrupted files, blah, blah, blah! (I don’t understand techno-speak). The Mind Games of Dr. Sova is my final installment in the Chauncy Rollock series. My protagonist, Chauncy Rollock has reached the end of his solo adventures. To celebrate the event, I am publishing The Chauncy Rollock Chronicles. This is a collection of his four adventures all in one big book! This tome contains the four stories in chronological order of reading and not the order they were published. If you are wondering why I didn’t publish these stories in order in the first place…well the simple answer is: Because I didn’t write them in order in the first place! (Inspiration doesn’t always come in order). 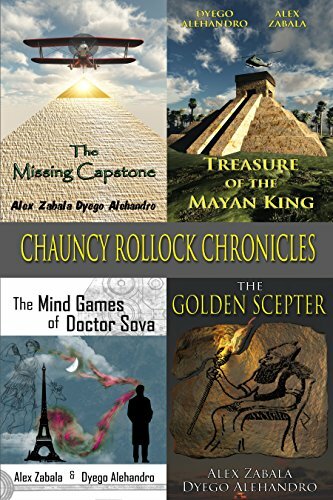 The Chauncy Rollock Chronicles is on sale now! This may sound as a contradiction but it’s not really the end of Chauncy Rollock. He will appear in cameo roles in future stories. These stories include a new series with Chauncy’s son, Troy Rollock. Troy Rollock is all grown up and he now takes the baton to continue his adventures in archaeology. But there is a difference…Troy’s adventures will be like Mission Impossible meets Indiana Jones. The new novel coming down the line is titled The Secret of La Danta. In other words, Troy will be able to do things Chauncy never could do. This makes it possible to expand the possibilities of braver and bigger adventures!